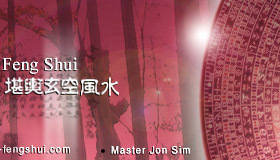 A Feng Shui Q & A Section with Master Jon & Auntie Liu. Greetings from Southern California! Can you help me to solve my problem? A short time ago after moving into my new office, I suffer great financial loss on business. I was born in Jun 28, year of 74 tiger in Chinese horoscope. My main cash and information counter faces the main door, which is South direction. A 3 ft marine aquarium setup was situated at the west location beside my customer waiting tables. Do you have any comments? First of all you should never place any moving water in west this year. It will definitely bring financial loss of any kind. Secondly, 5 yellow is located at the west palace for 2006 & we're afraid that you may did some grounding work during your marine tank setting. Thirdly, base on your year of birth, west sector (W1), you are not allow to place an aquarium tank for the reason that you'd offended your "Official or government Sha" palace. "Official or government Sha" also means backstabbing by unfavorable people. This group of people can bring harm to your business growth. It is would be best to remove your aquarium tank as soon as possible. My main entrance doorway is facing towards a Cross Junction. These causes bad luck? Not Always the Case. Main entrance facing towards a Cross Junction may also indicate gathering of positive energy and bring about prosperous luck to occupants. We need to examine the exact location of your main entrance base on the "Incoming" and "Outgoing" House Gua for your problem. Can one Fengshui remedy work for both wealth and romance at the same time? There are no one size fits all remedies in Classical Feng Shui. Just like symbol of Yin & Yang, which are clearly divided into black and white within a circle. Different purposes involve different methods and locations for activation. You need to decide what you want. Keeping small bowl of gold fish in bedroom means loss of wealth? These are just general terms and concepts. If your secondary wealth corner is located inside your bedroom, a small fish tank or water feature can bring about great fortune to occupant. Do take notes that the goldfish don't bring you wealth. It is the water that gathers the good "Qi" to bring about beneficial changes in your life. What you've heard is just another old folks myth. Tie Shu, aka corn plant (scientific name Dracaena Fragrans) are just another type of plants that produce the same function like most Plants does, to help keep the indoor environment clean, aiding in oxygen/carbon. Any types of green plant can be use. I got interested in FS and start reading books on related topics but I am absolutely confused. Most books suggested Three Legged Toads, Dragons, and Lucky Money Cats for wealth. Do they work? You are not alone in your confusion. These questions are often asked. In school of classical Feng Shui, we do not use them at all, however, if you "believe" they work, they will. We can't ignore that the power of the mind do exist. Just like anyone else, the power of mind can actually make one climb to great heights. No one can argue with this. 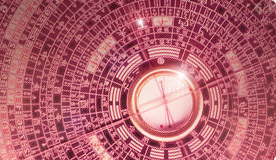 Feng Shui, Is it Science, Art or Superstition? Or it's just a myth. Human beings have always been mythmakers. "Once a myth, always a myth." Feng Shui is not about superstition, philosophy or religion; It is about enhancing and harmonizing the flow of energy in the environment by understanding the metaphysical forces of nature better known as "Qi" to be able to manipulate them to enhance your life achievement. If that's a myth, think again. 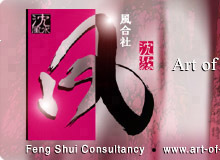 Why many of the largest businesses and Corporations in the world used Feng Shui layout to help business growth? A lamp pole directly in front of the main door causes bad luck? Can you suggest a cure to dismiss my fear? You need to observe how close this lamp post / pole is to your main door. If it is located across a fairly wide street, you are quite safe. If this problem is present, the best way we normally advice our customers is to tilt and angled their front door (door frame) away from these objects. Besides solving the problem, one advantage using this method enables you to choose and locate a more auspicious facing direction base on prosperous "Yun Gua" aka Auspicious Timely Gua of the period using a Luo Pan compass. Does Date selection and time activation important? Why some people had great result without using this method. Yes. most Practitioners or even beginners have the knowledge to suggest appropriate changes for home and working environment. But, without suggesting an auspicious date and time selected to perform these changes, most formation don't work at all. People win lottery every week. So it does happen. Lots of people get to play at the same time and the lucky ones got the strike. Hi Master Jon, I'd come across your article regarding Art of Water Placement & was worried that I might violate both the Direct and Indirect Spirit rules. Few months ago, I'd hired a Feng Shui master to my place hoping to increase both my wealth & business growth. I was advice to have a Five Ghost Carry Treasure formation in my office. In order to activate this formation, I was told to place a water fountain at Northwest location and I followed what had been told. According to what you'd written, having water feature in northwest location means violating the Direct and Indirect Spirit rules. Here's my concern, does Five Ghost Carry Treasure make an exceptional case? Lastly, do the formation have different grade? Dear Joseph, you've already violated both the Direct and Indirect Spirit rules. Never place a water feature in Northwest sector no matter how good that spot is including Five Ghost Carry Treasure. You may encountered more difficulties in life rather than getting the benefits you had asked for. For your final question, 5 ghost carry treasure formation is base on external environment. Your external surrounding must first have the correct type of energy flow before it make possible. Not all houses or offices are ideal for this special formation.. Not all houses or offices are ideal for this special formation and may require tilting of main door entrance to a certain degree. In some ways, crystal does work but not all the time.